If you live in a stone-rich area and want to build in the vernacular style, choosing stone will be part and parcel of your design process. However, this traditional building material does not only lend itself to traditional homes, but looks just as striking on a contemporary home. Of all the cladding options it does tend to be the most expensive, but if you can get your stone home right the investment will certainly be worth your while. Here are nine self builds that show stone really is a solid choice. This steel frame home in Monmouthshire has been clad in stone, quarried just three miles away. The timber cladding brings softness to a utilitarian form, creating a striking home for modern family life. The 175mm-thick stonework cladding cost £32,000. 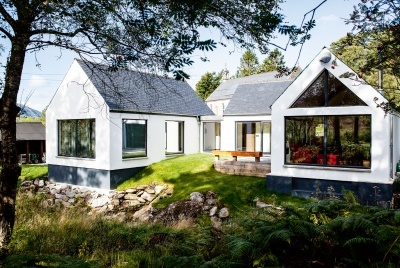 Farmer Neil Gourlay and his wife Mary have built a home using materials sourced from their 300-acre farm. 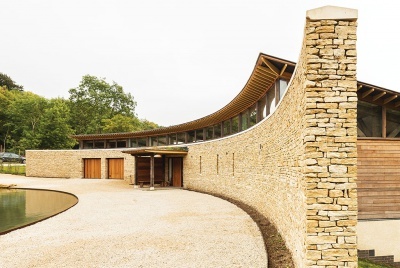 500 tonnes of stone was collected from the land and paired with oak cladding made from wind-felled trees for a home that is not only truly sustainable, but also blends perfectly into the landscape. The dry-stone wall passes through the centre of the home and is heated by a woodburning stove. The thermal mass of the stone is then heats the entire living space and adjoining rooms. Inspired by time spent in Yonkers, New York, Karen and Michael Duff built a New England style home upon returning to Ireland. They chose natural materials that were durable and would get better with age, such as the stone exterior detailed with red brick. The house is new and practical, but also looks like it has been standing there for the last 150 years. Granite and timber cladding were used on this self build to make sure it had minimal impact on its secluded site in Dartmoor National Park. The design follows the slope of the site, and on the approach the house appears to be single storey. Exposed granite interiors help bring the outside in while complementing the contemporary decorating scheme. All of the building materials were sustainably sourced and chosen for their low maintenance properties. 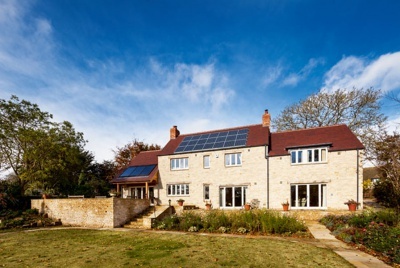 This Wiltshire home, built for just £135,000, was constructed from Thermalite blocks and clad in Farmington natural stone. The stone gives the home a classic Cotswold feel, befittings its location on the edge of a town, overlooking rolling Cotswold countryside. This boathouse-style home was built to a design that evolved around what was realistic for the site — and in the eyes of the planners. David and Annette were keen to build their home in the context of an old castle, and wanted their new house to look like it had been there for years. The stone was sourced from the site. The owner of this eco home was looking to build something that was distinctive and embraced nature. Using an oak frame structure, clad in stone he has done just that. SIPs were used to create a highly-insulated, airtight shell, apart from in the curved section which had to be insulated with sheep’s wool due to the shape. When building a new home in a period style, the choice of materials is absolutely crucial. Stone was the obvious choice for the barn-style section of this house, which also has brick and timber clad additions, making it look like it has grown over time. Carol and Gerry Walsh have created a home out of the shell of someone else’s self build that, 30 years after breaking ground, still wasn’t finished. The couple was influenced by American architect Frank Lloyd Wright, who built modern homes in stunning locations using local, natural materials. 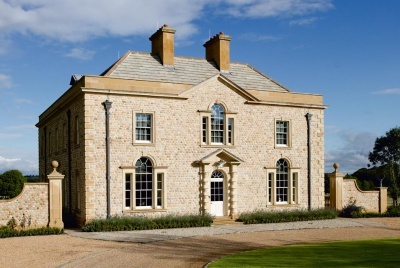 They chose Cotswold stone to suit the surroundings of their Gloucestershire village.